With Winter now behind us, and Spring filling the air with beautiful aromas, we are full of enthusiasm for another attempt to locate the crash site of ZK-AFB. This year we plan to stay in a caravan instead of tents. Because of the high rainfall... AND the Sandfly problem, we decided we needed a little comfort. You know, it's not a very nice feeling to awake from a deep sleep to see the roof of the tent too close for comfort! Phew! That was scary! Not only that, but we almost wore out the zips on the tent doors. We had to keep the Sandflys and the Bumblebees out somehow! So we decided upon a caravan... it had to be an old caravan not only because we like old things, but also because we felt that an aluminum caravan would be shaken to bits on the rocky trails up the riverbeds. The modern type of caravan is also very low slung. That is, they have torsion bar suspension which makes the caravan very low... a very good idea because you don't have to clamber up a cliff each time you wish to go in or out! 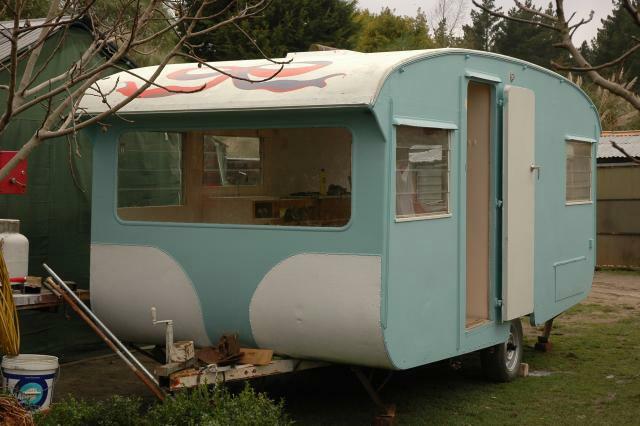 Well, we aquired our caravan... an old classic caravan from the early 1960's. It's made of plywood and has a leaf spring suspension like old cars and trailer use to have years ago. We put the axle under the springs instead of on top of them, which gave us about 6 inchs more height. We also put larger wheels on it, and altered the drawbar to take hydralic brakes. To date we have almost finished painting out the inside, and only have the outside left to do... that is after we renew the bench top and put some book cases and pictures on the interior walls. Yes, it's going to be fun... real fun living in a caravan up in some of New Zealand's finest scenery. At the present time we are unsure exactly when we will make the "Second Expedition" as we are very busy working. It will possibly not happen until early in the New Year, but once the caravan is finished and we have finally worked out how we will tackle this years exercise, we will be almost ready to set off... until then, keep watching! After so many months hard work we are finally almost ready to leave on another episode of our adventure. Just a few more jobs to do, then hurrah to work... we'll be off!!! 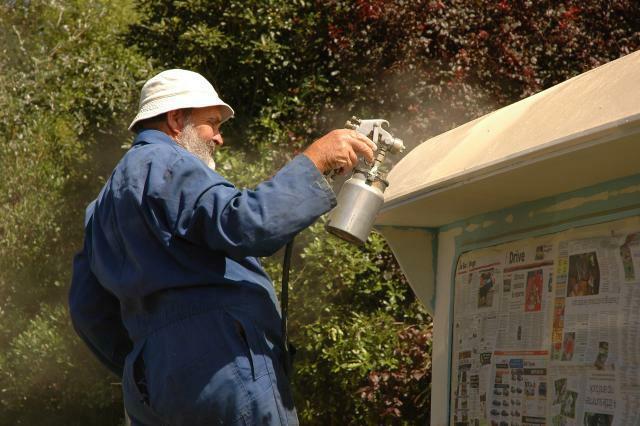 We are currently in the middle of painting the caravan in very classic colour... cream and maroon. 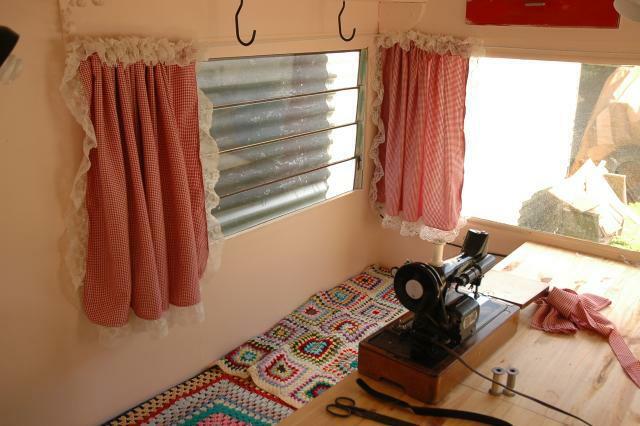 Adam has made brand new curtains for it, with the help of an antique Singer sewing machine. Yes, they look very pretty with their lacy frills! More like a gipsy caravan of a by gone era! Because the caravan only had 3 berths we had to redesign the interior to make it sleep four. So now, the front end has two very short beds with a pull out section each that makes two very comfortable 6 foot beds! Adam cut up a couple of old fashioned (real) rubber double mattress', then stitched up some coverings from second had duvet covers!!! He is currently making new curtains for our holiday bus. We aim to leave very soon... as soon as the final jobs (mostly painting) are complete. The bus will tow the SWB Land Rover and small yellow trailer (it's legal because the bus is a heavy vehicle). The LWB Land Rover will tow the caravan. When we get down to the the Lake the bus will be left at a friends place whilst we tow the trailer and caravan up basically as far as it's possible to drive... hopefully as far as where we camped with the tents last Summer. We have several major river crossings to make, but with a good dash of luck and plenty of nerve we should be able to get all our belongings and our residence through. If not, we'll need our swimming gear to get our beds back! Well, what a hectic time it has been lately! First the newspapers, then the TV crews! WOW! It's really been in the news! There has been an interesting little article on CLOSEUP (TV) which can now be viewed on the TVNZ website at this address. Now that the caravan has been completed, it's only a few more things to do to pack the bus, caravan and two Land Rovers and little trailer... and we'll be away! 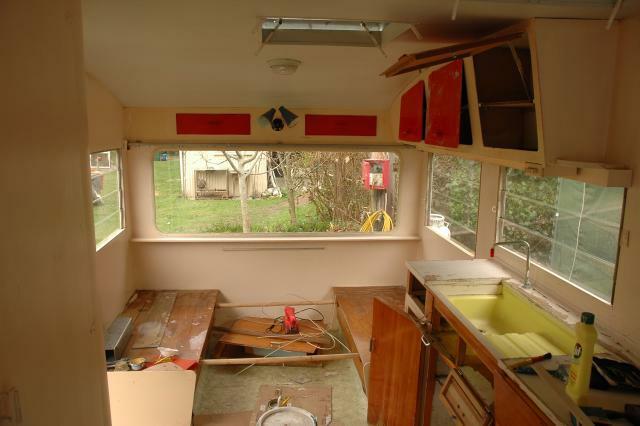 The caravan is now fully restored and ready to drown in those mountain rivers! I will see if I can manage to get a photo of the whole convoy on here in the next few days... Keep watching for any updates.